The city of Jackson is located in Butts County, Georgia. 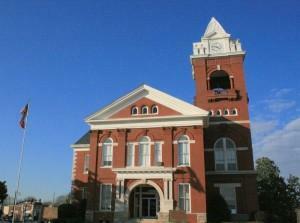 Jackson is the county seat of Butts County and has 3,934 residents as of the 2000 census. The city got its name after the President, Andrew Jackson. The city was founded in 1826 and was only 303 acres. That land was divided into lots and then people began moving into the city. Jackson had a downfall during the American Civil War wherein the city was demolished by the army which marching to the sea with General William T. Sherman. This caused an economic struggle for quite some time in Jackson. The boom of the city came about following the arrival of the railroads in the 19th century. It was in May of 1882 that the train first arrived in the city of Jackson, this began a whole new era of transportation. Throughout the 20th century, the city continued to grow and the arrival Interstate 75 allowed the residents of Jackson to have access to the larger cities. Jackson is located just about 40 miles from the big city of Atlanta. The residents of the city value the progressive and diverse environment along with the rich history and culture still present in Jackson. The town has charms about it that make the residents proud to call Jackson home. Van Sant Law, is a high-quality personal injury law firm located in Atlanta, Georgia. The Alpharetta personal injury lawyers at the firm proudly represent clients from the city of Jackson. If you are a resident of Jackson and suffering from any type of injury or accident, contact our firm and see how we may be able to help you! If you have suffered from any of these accidents or any others, you need to seek representation from the best personal injury lawyer in Jackson. Attorney David Van Sant from our firm is highly qualified to take on your case. Previous clients have presented only positive reviews about Attorney Van Sant. In doing so, he has received a 10.0 “Superb” Avvo rating and also earned the Avvo Client’s Choice Award. You can read some of the positive reviews and hear from real clients by viewing our client testimonials page. When it comes to the legal field, the lead attorney at our firm is also highly credited. David Van Sant was voted a Super Lawyers® Rising Star℠ and was also chosen to be a member of the National Trial Lawyers Top 40 Under 40 organization. The lawyer that you choose to represent you can greatly affect the outcome and compensation that you get out of your case. Van Sant Law, is dedicated to providing high-quality legal representation while doing all that we can for our clients during their time of need. We have had abundant success in reaching large settlements for injured victims. Attorney Van Sant from our firm is a member of both the Million Dollar Advocates Forum® & the Multi-Million Dollar Advocates Forum®. These are two of the most prestigious groups to be a part of because in order to join, you must reach million dollar and multi-million dollar settlements. We are proud to be able to help clients reach these high-dollar verdicts to help them move forward from their injuries. We may be able to help you as well. The time following an accident can be stressful and overwhelming. We want to help, let us handle the legal matters while you focus on recovering. Our firm is less than an hour from the city of Jackson and you can even have your consultation over the phone. You can contact us at (678) 679-6710 or visit us at 3525 Piedmont Road NE #300 Atlanta, Georgia 30305.